HUMIS IS THE ORGANIC COMPONENT OF SOIL. Dead plant and animal tissue falls to the ground where it is broken down by decomposers into small particles of humus. 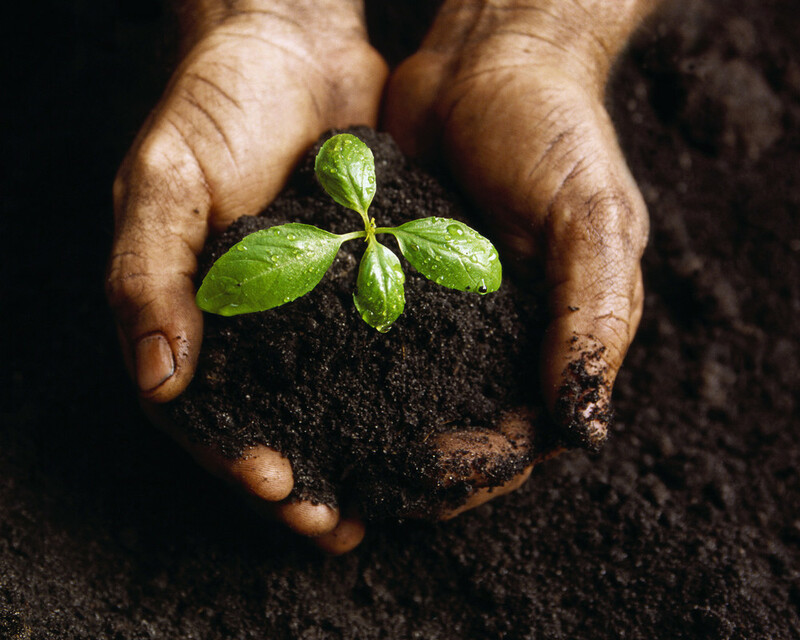 Humus is the most important soil particle for life, because it contains all of the nutrients that plants need to grow. It is a rich dark color and occurs only in the top layers of soil. SAND, SILT, AND CLAY ARE THE INORGANIC PART OF SOIL THAT FORM FROM WEATHERING OF LARGER ROCKS. The amount of sand, silt or clay present in the soil generally depends on the PARENT MATERIAL. PARENT MATERIAL IS THE ROCK THE SOIL FORMED FROM. If it formed from sandstone, the soil will be very sandy. If it formed from shale, the soil will be rich in clay. RESIDUAL SOILS FORM DIRECTLY ABOVE THEIR PARENT MATERIAL. TRANSPORTED SOILS ARE SOILS THAT FORMED IN ONE LOCATION, AND WERE THEN TRANSPORTED TO A DIFFERENT AREA BY EROSION. In this case, the soil does not match the rocks directly underneath it. MOST NYS SOILS ARE TRANSPORTED. Life contributes to the formation of soil in several ways. In areas covered by rock, plants like mosses and lichens move in and begin to break the rock apart into sediments. As these plants die, they are decomposed and add organic matter to the sediment. Over thousands of years this accumulation of weathered rock and organic matter piles up and forms a layer of soil. As soil continues to develop, it forms different layers called horizons. We can see these layers when we take a soil profile, or a cross-section of Earth exposed by digging. In most mature, or well-developed soils, the profile has three distinct zones or horizons: A, B, and C.
The A HORIZON IS MADE MOSTLY OF TOPSOIL WHICH IS GREY TO BLACK AND NUTRIENT RICH. Topsoil tends to be dark because it has more organic material called humus. Humus is formed from decayed plant and animal material. THE B HORIZON IS UNDER THE A HORIZON. IT CONTAINS MORE CLAY AND LESS ORGANIC MATTER. The subsoil contains more clay and is usually red or brown and has a higher mineral composition than the A layer. THE C HORIZON IS MADE UP OF SLIGHTLY WEATHERED PARENT MATERIAL THAT COVERS THE BEDROCK. The relative abundance of sand, silt, and clay present in soil effects several important properties of the soil. 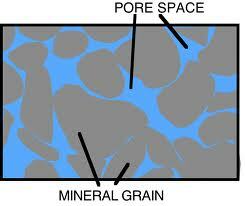 POROSITY IS THE VOLUME OF OPEN SPACE BETWEEN SOIL PARTICLES. Porosity is directly effected by the size of the soil particles. Larger particles like sand have more space between them, so they have higher porosity. Smaller soil particles like clay have tiny spaces between them, so they have very low porosity. When particles of different sizes are mixed together, the small pieces fill in the gaps between the large ones, making the porosity VERY low. PERMEABILITY IS THE ABILITY OF WATER AND AIR TO FLOW BETWEEN PARTICLES. 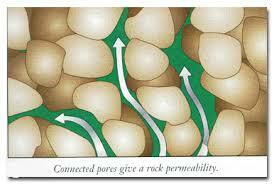 Permeability and porosity are related in an obvious way. If a soil is very porous, then it has lots of space between particles, so it will be easy for water to flow through it. In contrast, if a soil has low porosity, then there is very little space between the particles, so it is difficult for water to move through it. When rain falls onto the ground it has to go somewhere. If the soil has high porosity and high permeability, then that rain will infiltrate, or drain into the soil. INFILTRATION IS DRAINING OF WATER DOWN THROUGH SOIL AND ROCK. If the soil is impermeable and has low porosity, then the rain won't be able to drain into it. Instead the rain will have to flow across the surface as runoff. RUNOFF OCCURS WHEN RAIN CAN'T INFILTRATE, AND IS FORCED TO FLOW ACROSS THE SURFACE OF THE LANDSCAPE. In general, more infiltration is better for soil.